Stirling Avenue Mennonite Church, Kitchener, ON. 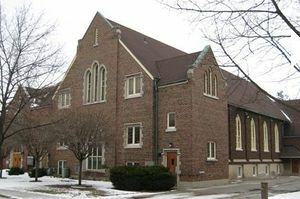 The Stirling Avenue Mennonite Church in Kitchener, Ontario formally organized and began worship services in August 1924 with 115 members. The first building, constructed on the same block as First Mennonite Church, was occupied in February 1925. Prior to completion of the 1925 building, Stirling Avenue met at First Mennonite Church on Sunday afternoons. Urias K. Weber, who had been a pastor at First Mennonite for 17 years, became the leader of the new, more liberal group that separated from First, primarily over a dispute involving the traditional dress code for women. Both congregations, now within the same conferences, have worked cooperatively for many years. During its years as an independent congregation, Stirling occupied a unique position in the Mennonite mosaic. Sometimes at odds with other Mennonite churches, it also acted as a catalyst for change within the Mennonite community. Barred from conference affiliation in 1924, Stirling remained an independent Mennonite church until 1940 when it affiliated briefly with the Eastern District Conference of the General Conference Mennonite Church. It became a member of the General Conference in 1947. Membership in 2003 was composed of persons from both Swiss and Russian Mennonite backgrounds, as well as many from non-ethnic-Mennonite backgrounds. Language for worship has always been in English. A Hallman pipe organ was installed in 1967. Major building expansions took place in 1952 and 1992. Missionaries sent from the congregation included Leona Cressman, who served as a missionary in India from 1947-1982, and Alice Bachert who served in Colombia from 1931-1983. Other outreach efforts have included a clothing center since 1972. Carrie Harder was the first staff member to give leadership to the Peace and Justice Centre established in 1988. Stirling Avenue has participated in the founding of Conrad Grebel College, the House of Friendship in Kitchener, the Waters Mennonite Church (dedicated in 1963), and the Mennonite Coalition for Refugee Support. Burgetz, Kathy. "A Congregational History of Stirling Avenue Mennonite Church." Research paper, Canadian Mennonite Bible College, 1980, 67 pp. Mennonite Heritage Centre. Canadian Mennonite (30 June 1964): 1, 6; (18 July 1967): 3; (20 June 1969): 1; (30 January 1970): 10. Good, E. Reginald. Frontier Community to Urban Congregation: First Mennonite Church, Kitchener 1813-1988. Kitchener, ON: First Mennonite Church, 1988: chapter 8 for an account of the origins of Stirling Ave. Harder, Laureen. Risk and Endurance: a History of Stirling Avenue Mennonite Church. Kitchener, ON: Stirling Ave. Mennonite Church, 2003. Mennonite Reporter (12 May 1975): 4; (14 April 1986): 14; (1 May 1989): 16; (5 October 1992): 13. Thompson, Hartley. "History of Stirling Avenue Mennonite Church." 1973, 17 pp. Unpublished history of Stirling Ave. Mennonite, Mennonite Archives of Ontario. Mennonites in Canada collection, "MC(2O-Stirling Ave. Mennonite)," Mennonite Archives of Ontario. By Earle S. Snyder. Copied by permission of Herald Press, Harrisonburg, Virginia, from Mennonite Encyclopedia, Vol. 4, p. 635. All rights reserved. Stirling Avenue Mennonite Church (General Conference Mennonite), located at Kitchener, Ontario, was organized in August 1924 with a membership of 115, under the leadership of Urias K. Weber, who had for 17 years been the pastor of the First Mennonite Church (Mennonite Church), of Kitchener, from which this group separated on a matter of polity. Without conference connection for a number of years, union with the Eastern District Conference in 1946 was followed by union with the General Conference Mennonite Church in 1947. The present church building of brown brick, seating approximately 400, was dedicated on 1 February 1925. Until this time services were conducted in the First Mennonite Church on Sunday afternoons. A parsonage was bought in 1950, and the church enlarged in 1952. The membership is about one fourth rural, the remainder living in Kitchener and surrounding towns. U. K. Weber was succeeded in 1942 by Andrew R. Shelly, of Pennsburg, Pennsylvania, who was ordained as elder in 1942. Shelly was succeeded by Wilfred D. Ulrich, the present (1957) pastor. Feetwashing is optional and there is open communion. The membership in 1958 was 460. Millar, Anne. "Stirling Avenue Mennonite Church (Kitchener, Ontario, Canada)." Global Anabaptist Mennonite Encyclopedia Online. September 2003. Web. 20 Apr 2019. http://gameo.org/index.php?title=Stirling_Avenue_Mennonite_Church_(Kitchener,_Ontario,_Canada)&oldid=143185. Millar, Anne. (September 2003). Stirling Avenue Mennonite Church (Kitchener, Ontario, Canada). Global Anabaptist Mennonite Encyclopedia Online. Retrieved 20 April 2019, from http://gameo.org/index.php?title=Stirling_Avenue_Mennonite_Church_(Kitchener,_Ontario,_Canada)&oldid=143185.